Half pint crystal football tankard - fine quality lead crystal glass tankard with football motif inset in the base, and offered with Low-cost text and logo engraving. A classic half pint tankard, crafted in 10% lead crystal, and featuring a football design inset in the thick base. 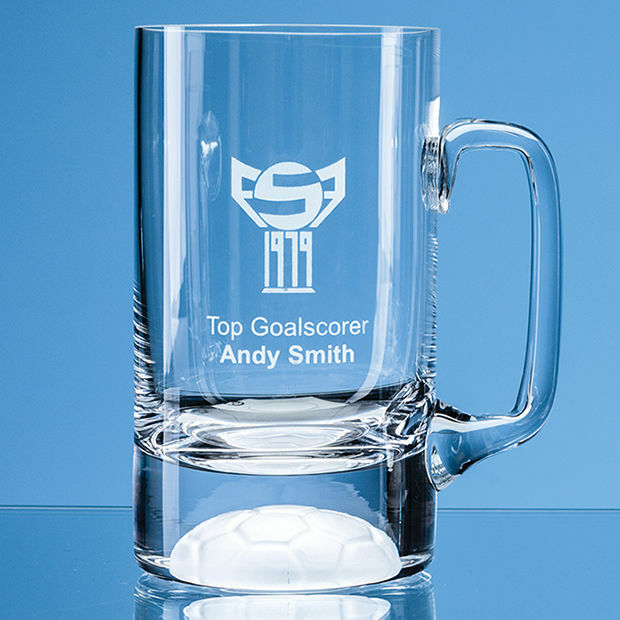 These quality glass beer tankards are ideal to engrave to create personalised football tankards as gifts or awards. They are offered with low-cost engraving of text and logos, so you can add your club's crest or a sponsor logo along with event or achievement details. A personalised glass tankard with a football theme is ideal both as a gift but also as awards for your team or club, for instance individual end of season awards such as Player of the Year, Top Goal Scorer or Most Improved Player. They are also suitable as commemorative gifts such as retirement gifts or 'thank you' gifts for your football coach or manager.